Don't Give Up Hope If Your Dog Has Cancer. Here's Why. 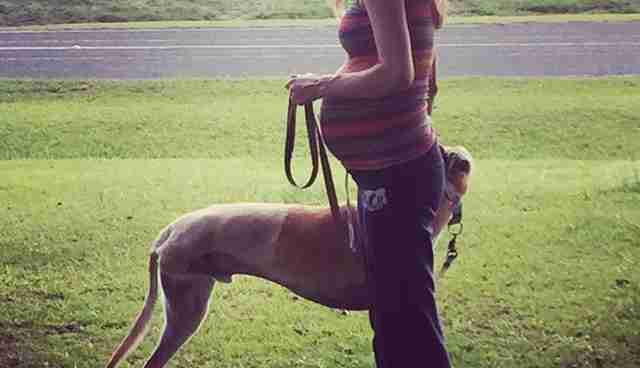 If there was one thing Jess Sidlowe wanted before her dog Gunner succumbed to the cancer that was ravaging his body, it would be for him to live long enough to meet her newborn baby boy, whom she and her husband Ed would name Wyatt. 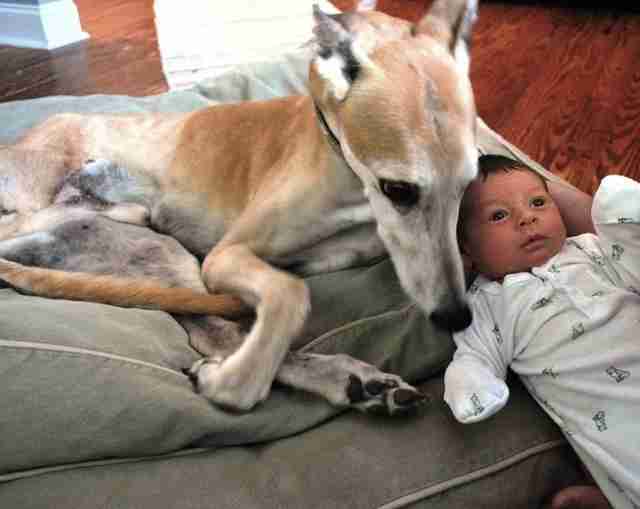 Gunner, a 10-and-a-half-year-old rescued ex-racing greyhound, had become an important part of the Sidlowe family eight years ago along with Ruby, their other rescued dog. 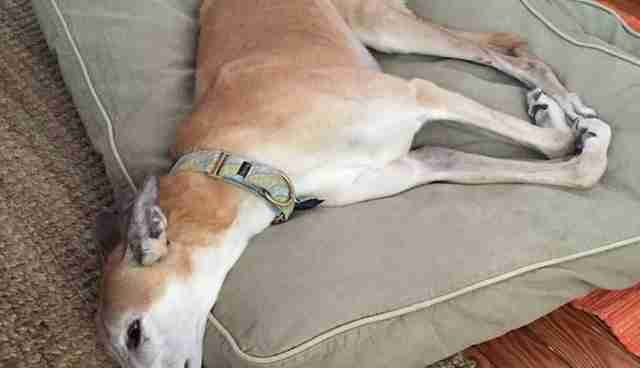 After returning home to South Carolina from a weekend in Pennsylvania in May 2015, they picked up their dogs from doggy daycare and noticed Gunner was limping badly on one of his back legs. At first, Sidlowe attributed Gunner's pain to a pulled muscle from getting more exercise at daycare than he was used to at home, but when she and her husband Ed noticed Gunner was not getting better, they were off to the veterinarian. A round of pain meds did not work. An X-ray showed what the vet believed to be a cancerous tumor. Cancer in dogs is very common, with older dogs most susceptible. In dogs 10 years and older, it is the leading cause of death. Typical cancers found in dogs include malignant lymphoma, mammary gland tumors, bone cancer and others, many of which are curable if caught early. Dr. Steven Thomasson, of Cochise Animal Hospital in Scottsdale, Arizona, told The Dodo vets are seeing more cancer than in previous years. "Two factors," he said. "One is that pets are living longer so older pets are more likely to get cancer, and also because we are better at recognizing and diagnosing it." But, some of the cancers found in dogs are quite treatable. "People need to really listen to what their vet is saying about what can and can't be done," Thomasson said. "When they hear cancer, it is not automatically a death sentence, but it is a serious problem." Sidlowe was referred to oncologist Dr. Kerry Rissetto of Charleston Veterinary Referral Center in South Carolina. Within 48 hours, the Sidlowes and Rissetto were discussing amputating Gunner's leg for what appeared to be osteosarcoma, a very common bone tumor mainly found in large dogs. A biopsy would confirm the cancer before the amputation. "We felt that [amputation] was the only thing that was going to, if nothing else, reduce the amount of suffering," Sidlowe said. 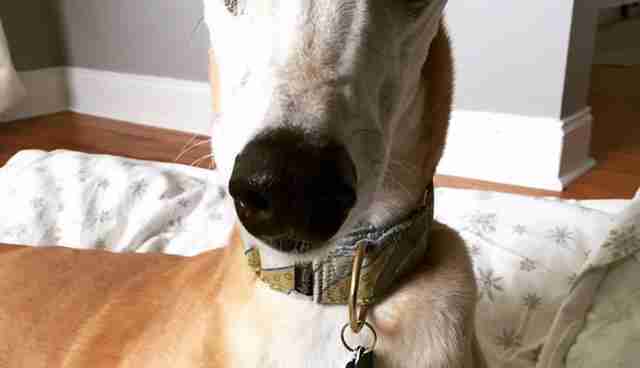 "Greyhounds' back legs are very muscular. The vet pointed out that his back right leg had atrophied so much it was flabby. It happened so quickly." The biopsy entailed pulling out a little bit of the bone to determine cellular behavior and the type of cancer. Following the amputation, the limb would be sent to Colorado State University for more tests. 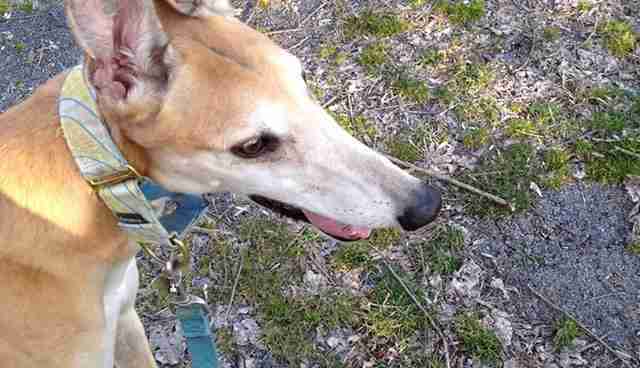 Gunner had issues in the past with his left back leg, which suffered a break during his racing days. There was calcification around the bone and that leg often became stiff. "What was unfortunate about this was the cancer was in the strong leg," Sidlowe said. Despite these concerns, the Sidlowes felt confident in their decision. "We knew we wouldn't have much more time with him," Sidlowe said. "He seemed his normal self and his spirit wasn't broken. We wanted the best for him and to extend his life as long as possible." They researched their options and determined that amputation would still allow Gunner a good quality of life. Although the out-of-pocket cost for the amputation was $6,000 and they were also preparing for their firstborn son to arrive, "we knew in our hearts we would do anything for Gunner," Sidlowe said. "I felt very guilty for putting him through that. I was so sick to my stomach the whole way home," Sidlowe said, regarding the moment when she and a friend picked up Gunner after his surgery. However, with each day of recovery, his swelling went down, the bruising lessened and his incision healed well. Fast forward a couple weeks, and Gunner was getting around better on three legs. "He had a normal hop and step that reminded me of a kangaroo," Sidlowe said. The cancer was actually histiocytic sarcoma. The tumors are pretty rare and aggressive and the prognosis is usually poor. After doing their own research on options, they decided it was best to keep Gunner comfortable for whatever time he had left. The vet would monitor him, and Gunner would enjoy his remaining days. "If he could make it to meet little Wyatt, I'd be happy," Sidlowe said. Sidlowe gave birth on July 21, just months after Gunner's diagnosis. 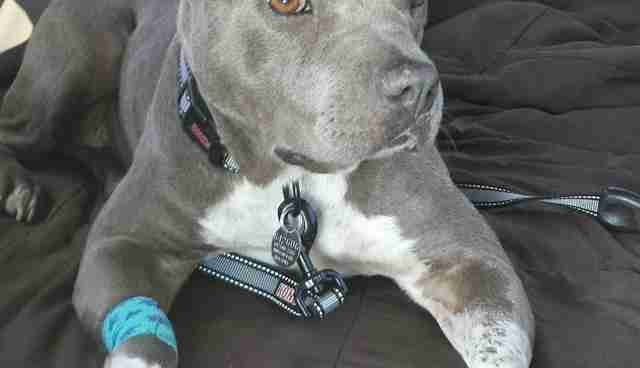 Upon her arrival back home, Gunner was coughing and limping. It was not the cancer; instead he had contracted pneumonia. He received treatment and slowly improved with medication. However, he continued to lose weight. "He would really just lay in bed," Sidlowe said, except when they took him out to go to the bathroom. Two weeks later on a Friday, Sidlowe heard the crying. She thought Gunner had to relieve himself. But he could barely stand up. When she went to lift him up, the dog yelped loudly. "I could see it in his eyes he was still there, but you could just tell it wasn't good," she said. Although they had a vet appointment on Monday, she made the call that day. "There was no way he could get through the weekend without seeing the vet." Sidlowe's husband Ed met her at the vet. He had to carry Gunner inside. There were two options: Medicate and see if it helped with the pain. Or put Gunner to sleep. "I kind of knew even before I scheduled the appointment," Sidlowe said. "I wanted him to go with some dignity left. It's a really hard judgment call to make." They decided to put Gunner to sleep. They were by his side the whole time. "If we had to do it over, we would have moved forward the same way," she said. "It wasn't fair to him to have him suffer. He was such a good dog." 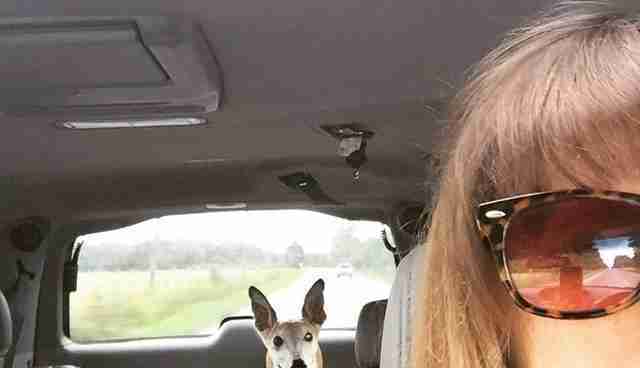 Mary Ann Everett, the founder and director of Surrendered Souls Rescue in Tempe, Arizona, also knows what it's like to deal with cancer in dogs. 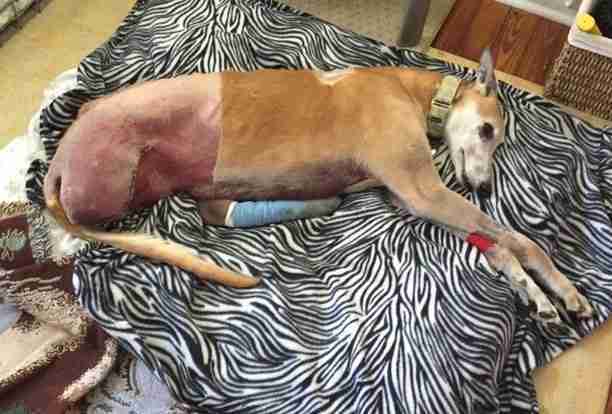 Everett mainly takes in sick and injured dogs from the pound. "Every dog I pull has a medical deadline," she said, which means the animal needs medical attention fast. If a rescue does not step up, the animal is scheduled to be put down. 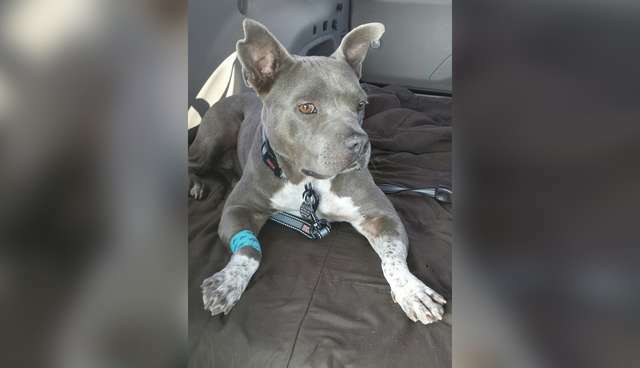 Before she even got Pixie, an American pit bull terrier and French bulldog mix, about five months ago out of Maricopa County Animal Care & Control, Everett reached out for donation pledges to save her and raised $1,500. Within three hours she had enough money to cover Pixie's entire treatment for a transmissible venereal tumor (TVT), which is a form of cancer transmitted sexually from one dog to another. The disease typically occurs in stray, non-neutered dogs. The tumors rarely spread and the prognosis is typically very good. "For the most part, TVT cancer is curable if you catch it early," Everett said. 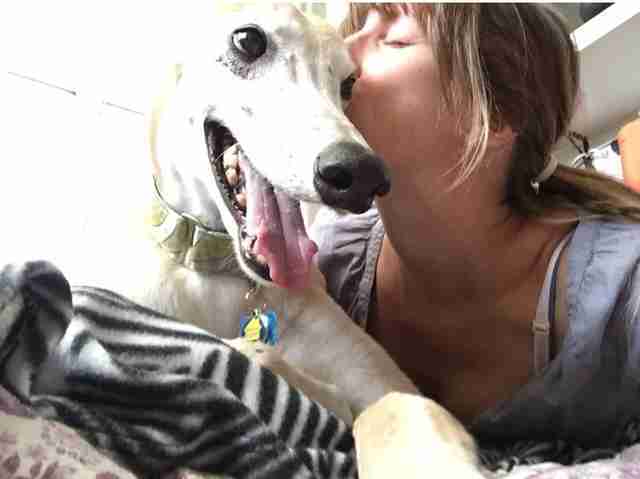 Pixie was brought to veterinary oncologist Dr. A. Elizabeth (Betsy) Hershey of Integrative Veterinary Oncology in Phoenix, Arizona, the day after her rescue and her TVT treatment started almost immediately, lasting a total of three months with no side effects. Within a week, the tumor shrank. "Pixie is a little go-getter and the cutest little thing," Everett said of the 40-pound dog. "She is in complete remission. The tumor is gone." Hershey will continue to see Pixie in two months, six months and again in one year. If, after that, there is no recurrence, she will have been cured, according to Everett. The good news is that Pixie has been adopted. "I can't save them all, but for the ones I do save, I make them a promise I will do everything in my power to make them better," she said. Sidlowe recommends, if you find yourself in her shoes, asking other pet owners who have been through similar situations and educating yourself. "[Euthanasia is] not a decision to take lightly, but you have to balance what's right in your head and what's right in your heart," she said. "Sometimes you have to do the best thing for the dog, even if it's not the best thing for you." Sidlowe got her wish and her son was able to meet her beloved dog. "Life is too short and it's definitely too short for animals," she said. "Everybody just needs to chill a little bit more than they do. I should take a page from Gunner's book. Sometimes you just have to lay in the grass and take in the sun; it was his favorite thing to do." The National Canine Cancer Foundation has information on canine cancer and how you can donate to help find a cure. You can also donate to Surrendered Souls Rescue to help offset the costs of medical treatment for dogs.